Thank you to Maria, Kirsten, Lisa, Sarah, Kathryn, Sindy, Janice, Catherine, Monica, Chantal, Marisa, Nancy, Pam, Kim, Doris, Paula, Tina, Tammy, Sylvia, Karmyn, Rebecca, Cristin, Rosemary, Kathy, Mimi, Denise, Frankie Ann, Sonia, Amy, Kellie, Tootie, and Lisa for all the below, straight from their hearts and minds. Start looking for a good thyroid doctor NOW! Don’t wait until you see the endocrinologist you are referred to & realize that you have to fight for the correct medicine & dose. (Use the info on the Stop the Thyroid Madness site to screen the doctors.) I’m 3 months out from my surgery and still have 2 months until I get into the doctor who I [think] will be good for me. Be pro-active in your health care…ask questions and if possible, find a good advocate that will be your partner. This is a lifelong illness and the more informed and pro-active you are, the better for your health. If you don’t like your care, your doctor or your meds, change them. Educate yourself, search the internet, ask questions, be informed. Empower yourself. LEARN LEARN LEARN; READ READ READ!! Educate yourself! Don’t solely rely on the limited info that traditional medicine will give you. Think outside the box. “All drugs are poisons. The benefit depends on the dosage.” ~Philippus Theophrastrus Bombast. Get the Stop the Thyroid Madness books & be your own best advocate! Join a support group on Facebook, ask questions & listen to those who have been thru it. Read, gather all kinds of information. Read/learn everything you can on your disease! Educate yourself and make sure the option you take is ok with you, as it is a life changing surgery. I would have kept mine and give natural cures a chance before taking it out. Advice has it’s place but it never should replace your gut, your knowing about you. I panicked and in doing so gave away all my control to what happened. Get as many answers as you can… You have more choices now although be prepared for backlash. Get very educated. Find support whether it’s a online group or family and friends. Ask as many questions you feel until you get answers. Don’t give up there is something out there that is right for your body. Educate yourself before you make any decisions. Find a doctor that will listen to you. Educate your family and friends, they will not always “get” what you are going thru, but if you educate them they will understand more often than not. Be nice to yourself. Win the argument! Some things we just can not control, but we can argue with cancer not to control our spirit. Things will probably get bad before they get better, BUT never forget that each day would’ve gotten worse with the cancer still in your body. Breathe deeply. Go to a place where you feel safe from everything in life. Sit there and just feel it all: the fear, the panic and the tears. Get it all out! When you are done start to take charge. Education is power and power is control, and control will always lead you to your life as you want it to look like. 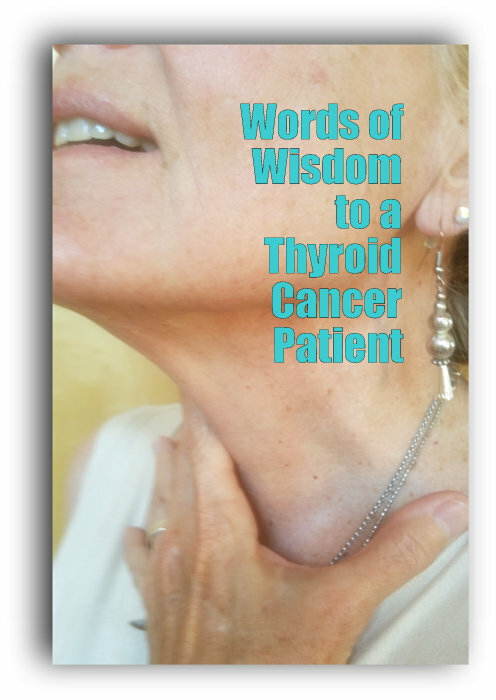 We had two choices: die of cancer or live without a thyroid. I don’t regret my decision to live! No regrets for my thyroid removal. I too choose to live without a thyroid. We will all beat this cancer. Stay living in the moment. Thinking too much about your possible future just leads to increased anxiety. Believe with every cell in your body that you will beat this. Doctor shopping is not a crime. You have to have 100% trust in the person who will pretty much determine how long you are going to be on this earth. Don’t settle with mediocre doctors. Take control of your healthcare and find someone you can work with. Dont settle for crappy docs. Don’t just trust what your doctor says as truth. Don’t let doctors bully you. Question doctors and don’t settle for one if you doubt their care. Find a doctor who is on your team. Punch the doctor in the face when he tells you that this is the cancer you wanna have. Find the right doctor for you. Some listen, some don’t. Some say levothyroxine is the way to go, but there are more options out there. Stay in tune with your body and how you are feeling since the doctor doesn’t know how you feel. Be persistent in what you need. Remember your Doctor works for you and you can fire them! Naturopathic Doctors: Don’t hesitate to put them in charge of your care! Never let a doctor just �tell you� the results of your labs. Get a copy of those labs from every doctor visit. Question your physician: He/She is not God. Fight for your health. Get second opinions! Its a roller coaster; some days are good, some days are bad. Sometimes diet change/supplements/ and plain old meditation will make you FEEL better. Listen to the doctors you have entrusted with your life, they can make you well, but you can get rid of that crap feeling with clean eating and meditation. Begin on natural desiccated thyroid. Fight to get put on NDT. Know that you CAN go right on NDT after your cancerous thyroid has been removed. You don’t have to go on T4-only synthetic meds first to “heal”. Thyroid cancer is the “step-sister” cancer. You won’t lose all of your hair, you likely won’t have chemo, but our hormone meds and the radioactive iodine is our “chemo” in some ways because of the isolation and the long term effects. There is no 5-year mark. There will always be a chance of reoccurrence. Things won’t ever be the same but we can live a quality, wonderful life with the the right replacement meds, educating ourselves, a positive attitude, a healthy lifestyle and being very proactive. Give yourself a break and realize that there WILL be a new normal for you whether you like it or not. Keep up with annual scans. It’s not the easy cancer and it can spread. Some days you will feel like you’re walking thru quicksand, and other days, you’re gonna feel like you’re walking on clouds. Be gentle with your body while you are healing (after surgery or RAI treatment). You will have a new normal and give yourself time to find it. Don’t be afraid to fight for your health, find a doc that will treat your symptoms, not just T4 or TSH Levels. You are amazing and a strong person! RESEARCH, and avoid Synthroid at all costs. Living life is going to be different; loving life is going to be wonderful. Don’t expect to be able to do everything like you used to. It takes time. Don’t feel guilty that you didn’t have to go through tons of chemo treatments like other cancer patients. Focus on good nutrition, lowering inflammation and increasing antioxidants to give your body the best chance of healing. Don’t be blind sighted by how difficult this may be just because a doctor may say this is the �best� cancer to have. Some of it will be difficult. Menopause can be more difficult because of being thyroidless. Get a good ob/gyn to help you. Educate those closest to you so they fully understand. Go here to read about using Natural Desiccated Thyroid after having had thyroid cancer. Go here to read what patients say they wish they had changed.